While we are not at the CTC…..
By first and second year students, MPhil Textile Conservtion (2017-2018), compiled by Laura G García Vedrenne. The MPhil in Textile Conservation programme requires constant hard work to get good results. Every treatment, assignment, or lecture is worthy of full attention. However, there comes a moment when students have to get out of class and give those brain cells a break! This blog entry gathers a few descriptions of craft projects that CTC students enjoy doing on their spare time. 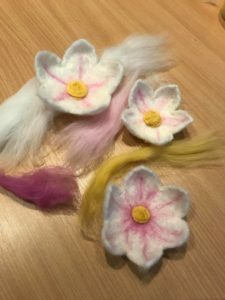 The idea of sharing something different to our regular conservation projects came from joining a workshop organised by Glasgow Museums, where Megan, Staph, and Laura got to make beautiful needle-felted Lotus flowers under the guidance of textile artist Johanna Flanagan. Despite being immersed on our dissertations, we found it useful to take a few hours to relax. We realised that most of us share the love for craft projects (mostly textile-related! ), which are a great way to de-stress and recharge energy for the following week. Needle-felted Lotus flowers made under the guidance of textile artist Johanna Flanagan. Becky Doonan: For spare moments I like to have a dress making project or two on the go. I find it a nice balance against our academic written assignments, giving my brain a break whilst also feeling productive. I love dabbling in pattern drafting and experimenting with different fabrics and styles. 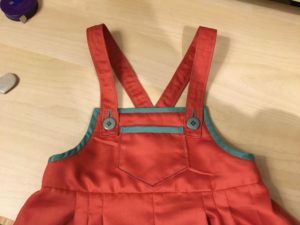 I recently finished a pair of baby dungarees and a dress for a friend and am now working on a dress inspired by my most recent conservation project of a 1950’s Dior dress. Andrea Goldstein: This project was inspired by a Hungarian design and measures about 10×10 inches. 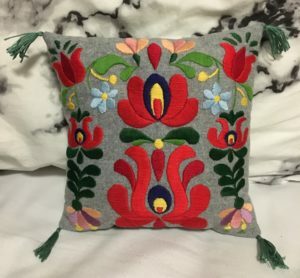 It is a cushion embroidered with satin stitch, chain stitch, and split stitch with cotton thread. It is stuffed with polyester wadding to save it from the trash! Its function is purely decorative. I made it in the evenings after school to work on something creative. It took me about two months working on it on and off. Staphany Cheng: My maternal grandmother taught me how to knit when I was around 8. However, it wasn’t until I was backpacking around Australia in my early twenties that I decided to pick it up again. At the time it was a way for me to be productive during 52 hours of train travel, which I had booked naively for the cross-country scenery (spoiler alert: it was beautiful and barren but relatively unchanging). 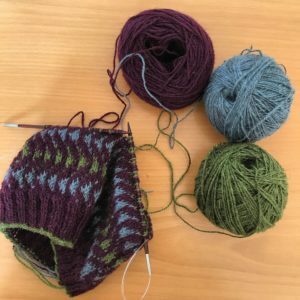 Over the last two years, knitting has been a way to quietly process and decompress after the daily assault of conservation learning. 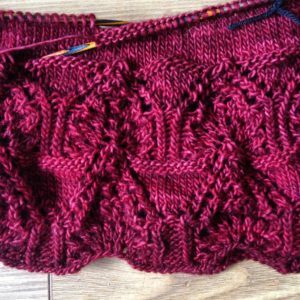 It is calming to go through the motions: insert needle, loop yarn, drop stitch and repeat. It is also instantly gratifying to see progress and development when everything else in life and indeed in conservation takes more time. On the left, the lace edge of a t shirt designed by Caitlin Hunter. On the right, mittens knitted for a friend who also moved to the UK. 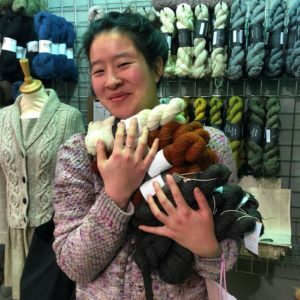 Being in the UK has meant that I have had the opportunity to knit with British grown and processed yarns and to go to incredible wool and fibre festivals. The project I am working on at the moment is a birthday present for someone, pending a speedy finish. It is a pattern called Bousta Beanie designed by Gudrun Johnston with a simple Fair Isle pattern, knit with yarn I bought from the Edinburgh Yarn Festival. On the left, Bousta Beanie birthday present. On the right, me at the Edinburgh Yarn Festival! Megan Creamer: Making bobbin lace has been a great way for me to relax and keep learning new skills over the past two years. I was introduced to Glasgow lace teacher Jean Leader by former CTC students, and many of us have taken lace making classes from her over the years. 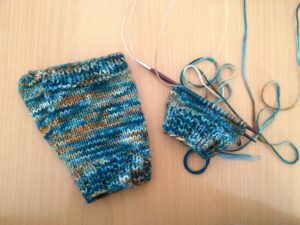 My first few tries were hilariously bunched up, full of missed stitches, too-many twists, and areas of loose tension. 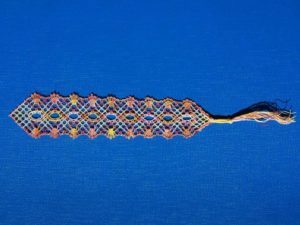 But after a few months, I became familiar with the basic stitches of bobbin lace, all formed from simple crossing or twisting of the bobbins. Through Jean’s personal collection of historic lace, I also became more familiar with needle lace, crochet lace, and knitted lace, though I have yet to take those up. The first piece of lace that I made well enough to share, was a piece of torchon ground. 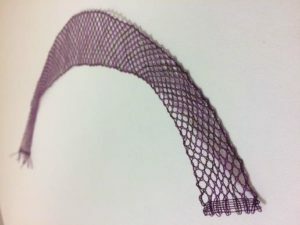 The colour work lace in two shades of purple was drafted by Jean. It was designed to be a collar for a boat-neck silk dress I had made for Laura. The lace collar seen on the left, just after it was finished. On the right, Laura wearing the dress with the lace collar. 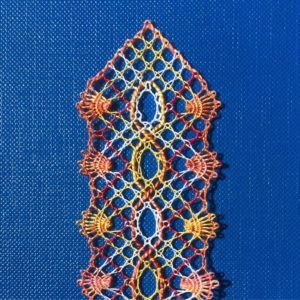 I really enjoy colour-work, so I have been making different patterns this year, incorporating variegated threads, and gimp threads that are caught between stitches, but not twisted or crossed into the structure of the lace. The bookmark below was just finished, and I am now working on another colour-way of the same pattern, which I will lengthen and use for a dress placate for myself, just as soon as I finish my dissertation. 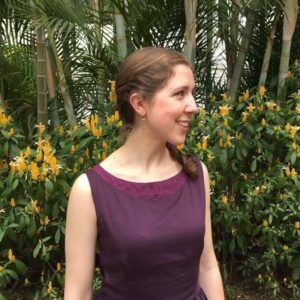 Laura G. García Vedrenne: I learned how to bookbind during my undergrad and have kept doing it ever since. I usually make books as a gift, a commission, or for personal use. The truth is that I have not bought a notebook for the past 5 years! I enjoy seeing the transformation of a pile of sheets into signatures that then become a functional object, but what I like the most is the wide variety of materials involved in the making. Whether I am using Mexican hand-made paper, scrapbooking printed paper, different types of fabric, or scraps of leather, there is always a new binding, stitch, endband, or design to try. This is what makes each book unique. 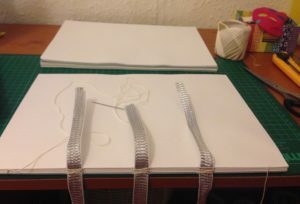 Process of sewing a French Link over three ribbons for a Coptic Stitch Book, on the left. Some of my most recent bookbinding projects, on the right. The only let-down of bookbinding is that my working space gets really messy whenever I start a new project so I have to allow plenty of time for tidying up. At the moment, I am completing a pocket notebook for a friend, as well as my next diary book for conservation projects. 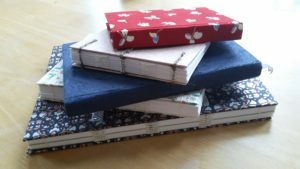 If you are interested in bookbinding, why not give it a go? It is extra relaxing if you do it while watching a movie! Emma Smith: Conservation treatment often requires stitched supports, which necessitates delicate and time consuming hand stitching. Although I enjoy hand embroidery and hand stitching in my free time, particularly doing a lot of English patchwork and quilting, I also quite like to get out of the conservation mindset and do something that allows for quick and creative results. 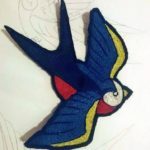 The image below shows a free machine embroidered patch created for my denim jacket. 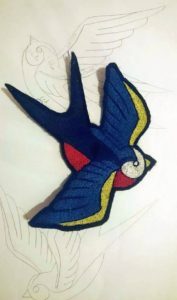 The patch is made from a black felt backing, with the design embroidered using coloured cotton threads. The sewing machine I have allows for me to drop the feed, meaning I can move the fabric in any direction and essentially draw and shade with the thread. This is one of the first patches I made but since then I have made a lot more and am really enjoying the quick results the technique gives. A great article showing that successful academic life is as much about enjoyable downtime as it is about hard study Our students are so talented on many fronts as these wonderful craft skills show. It is really nice to hear the personal stories behind everyone’s interests too. Thanks for sharing them with us, Laura and co!